Big Poppa Eats: A little tip - Telegraphe Cafe, a hidden oasis in a retail desert. A little tip - Telegraphe Cafe, a hidden oasis in a retail desert. The corner of 18th Street and 6th Avenue is one of those places New York City dwellers eventually find themselves. This is the heart of the mass of big box stores that run this stretch of 6th Avenue. At this intersection Old Navy, The Container Store, Bed Bath & Beyond, TJ MAXX, Modell's, West Elm and a Chase Bank all stand. The real Mall of Manhattan. We have all stood there, exhausted, frayed and shopped out with kids who are tired, hungry and probably crying. All you needed was a spot to drop your shopping bags and have a coffee and get something for the kids. Sure, City Bakery is down the street, and we love it, but it is always packed. What else is there? First the embarrassing part. I believe Telegraphe Cafe has been there for at least 10 years. I just discovered it. I can only wonder how many times I have walked by it, not giving it a second thought. I bet you have too. That is about to change. Don't kick yourself like I did. Telegraph is tucked off on 18th Street, just west of 6th Avenue. The entrance is off what looks like a side entrance or employee entrance for The Container Store. There is a big red sign above the entrance that is less than appetizing. A glance through the windows does not reveal much. Step inside and things start to change. The space is small. A counter with stools runs along the windows. Five two top tables are tucked into a corner. People are lined up to order. Then you get that first smile. The folks behind the counter are warm and welcoming. They take your order and pass you down to pay. Quick and efficient. The gentlemen at the register greets you like a friend. A French accent perhaps? Coffee, tea and espresso drinks are at the heart of the cafe. Small and focused breakfast and lunch menus are available. How about an egg, ham & cheese sandwich? Sure. At Telegraphe Cafe the cheese is swiss and instead of ham they have prosciutto. It does not come on a roll. Your options are a croissant (of course), a bagel or bread. I actually went for the multi-grain roll. I never go for the mulit-grain roll. Something is going on here. Egg & prosciutto on multi grain, I skipped the cheese. Yes. I took a bite. I was hungry. It was good. A fruit salad at first glance looks like a bowl of grapes. Digging in you discover blueberries as well as strawberries and apple cut small. Then you notice the hint of mint and touch of honey. Delicious. Once again, there is more than meets the eye. Not your average bowl of grapes. I may have eaten a little bit of this before the photo as well. Those five tables tucked in the corner run along a surprisingly comfortable banquet. Use of the free Wifi is encouraged. It is surprisingly tranquil. You envy the constant flow of people from the neighborhood who flow in. Clearly they come in all the time. How could you have passed by so many times and not gone in? A glance at the lunch menu reveals a nice list of sandwiches and salads. 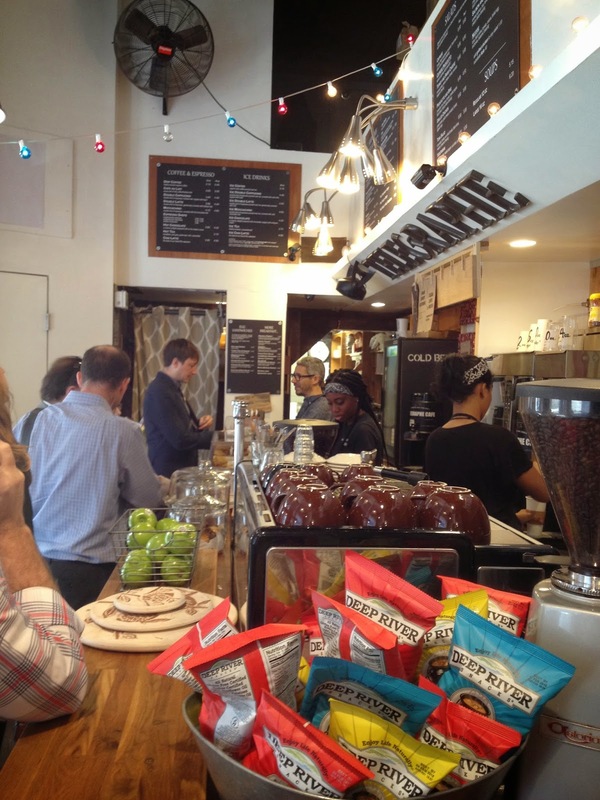 You notice the couple behind the counter. The gentleman with the accent who maned the register. Is that his wife running back and forth from the kitchen? You think so. French? Definitely. Maybe that explains it. Telegraphe Cafe would be a lovely little spot in any neighborhood, but in this retail zone, in a space that would more likely hold a crappy deli or dollar slice joint, it is a welcoming oasis. Now that I know it exists, I will never be hungry or thirsty in this chain store desert again. Neither will you. I've heard so good reviews about this cafe via http://www.trustessays.com/buy-essays-online and I must say its definitely worth a try. Its good to know that after 2 years their services and food have level up. Hello, Here we are providing you the best website for free games addiction solitaire online games. These games are very intresting and classic games. These games also comes inn VIP standard. You may try these games online, You will not find problem playing online. That's really nice. I test my gaming skills via my cafe game but using it's mod version for android. Great. Recently, I have shared some interesting games. You can download them and play them in the coffee too. Nice post. Recently, I have share snaptube game, you can try playing it for android phone right now. YOWhatsapp is a great whatsapp mode download the app for free. That's something which is new and great to see. Sharing such an awesome article with us makes clear how much you think about the readers. Get clash royale hack for free and enjoy playing the games.